The highly experienced dentists of Advanced Periodontics & Implant Dentistry recognize that there are many methods for replacing a missing tooth, including a fixed bridge. However, they caution patients against dental bridges because these teeth replacement structures can lead to tooth decay and further loss of teeth. Read on to learn more about the differences between dental implant and dental bridge treatments. 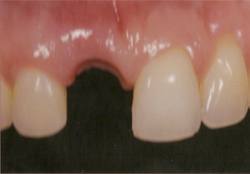 Another option to replace a single missing tooth is a fixed bridge. A high-speed drill shaves down a significant amount of the neighboring teeth’s natural structure. This prepares the teeth for the fitting of a fabricated three-unit bridge that is cemented in place. However, bone loss soon occurs, and plaque buildup is common below the margins of the crowns. The neighboring teeth lack adequate tooth structure, which makes them weaker and more susceptible to tooth decay. Tooth decay leads to root canals, and a root canal can eventually cause additional tooth loss.The bridge can be repaired, by the preparation of the additional tooth and the cementing of a four-unit bridge. Additional bone loss occurs and there is still consequences of additional tooth decay and root canal disease that may lead to another failed bridge. Two common options to replacing missing teeth include dental implants and dental bridges. There are key differences between the two. A dental implant is an artificial tooth root that is anchored in place of a missing tooth. A dental bridge, however, does not replace the tooth root. A bridge uses one or more surrounding teeth to support the bridge fixture. There are also alternatives to dental bridges that are effective replacement solutions. Single dental implants offer several advantages compared to dental bridges. An advantage of dental implants is while they function and look like a natural tooth, they also replace a single tooth without damaging surrounding healthy teeth. There is also a holistic approach to dental implants known as ceramic dental implants, which are metal-free implants. Many patients are concerned with toxins, such as mercury, being inserted into the mouth and ceramic dental implants are the perfect solution. At Advanced Periodontics & Implant Dentistry, patients are offered a number of advanced dental implants and periodontics treatments. All of the practice’s dentists have been recognized as highly skilled New York City / New Jersey periodontists who offer leading-edge gum restoration and gum disease treatments. Call us or click here to request your free dental implant consultation today!